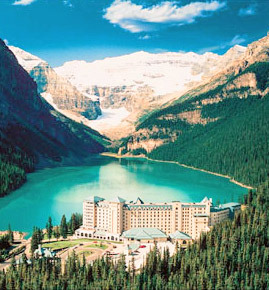 Lake Louise, is widely known as the “Jewel of the Canadian Rockies,” and for good reason. It’s truly one of the Canadian Rockies top vacation spots. The amazing color of this lake is nearly impossible to describe. It’s somewhere around blue-green and blue. Lake Louise owes its amazing color to rock particles created by the shifting of the Victoria Glacier. These particles are mixed in the glacier water and reflect the bright color. The Chateau on Lake Louise. Just like a fairytale. Lake Louise sits in a small glacial valley, 57 kilometres northwest of Banff, ringed by some of the most amazing ice-capped mountains Banff National Park and the Canadian Rockies have to offer. As if this place needed anything to make it more magical, the Fairmont Chateau Lake Louise, looking like it came right out of a fairytale, is situated grandly at one end of the lake. Lake Louise is like a diamond. Small, but nearly perfect. It offers a great travel amenities, fabulous dining experiences, local shops and unique accommodations. The quaint village is and ideal destination to escape the crowds with plenty of recreational activities and sightseeing opportunities to enjoy. Experience the Icefields Parkway, one of best-known scenic drives in the Rockies, and one of the most spectacular mountain highways in the world. The Columbia Icefield is the Parkway’s main attraction, where you can venture out onto the surface of the Athabasca Glacier in a Brewster Ice Explorer. Begin a tour of beautiful Lake Louise and discover the natural forces that have shaped the appearance of the lakes and streams found in this area of the Rocky Mountains. Continue on to Moraine Lake before crossing the Great Divide to experience Yoho National Park, the Spiral Tunnels, Emerald Lake, Natural Bridge and Takakkaw Falls. They say it’s impossible to see everything Lake Louise and Banff National Park have to offer in one vacation, or even in one life time. But really, it’s possible. Just jump in a helicopter. You can get a 360 degree view or the entire area, then land for some heli-hiking, ice-walking. And don’t forget the camera, as this is one of the best vantage points you’ll find for Rockies photography.